Please refer to our stock # 3324 when inquiring. 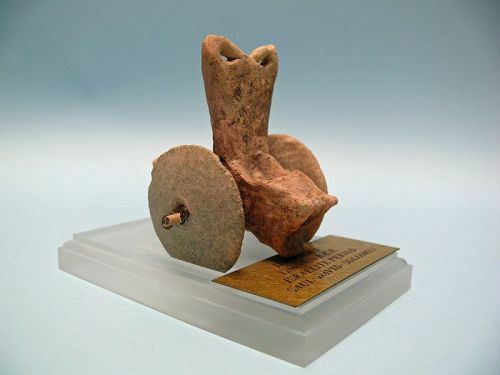 Iron Age I Terracotta Chariot, Israelite Period 1299 - 930 BCE. Time of Saul, David, and Solomon. 2 12/" x 2 1/2" x 2 1/2". On custom stand 3" high. Ex: Archaeological Center, Tel Aviv. Intact and in excellent condition. The Kingdom of Israel and the Kingdom of Judah were related kingdoms from the Iron Age period of the ancient Levant. The Kingdom of Israel emerged as an important local power by the 10th century BCE before falling to the Neo-Assyrian Empire in 722 BCE. Israel's southern neighbor, the Kingdom of Judah, emerged in the 8th or 9th century BCE and later became a client state of first the Neo-Assyrian Empire and then the Neo-Babylonian Empire before a revolt against the latter led to its destruction in 586 BCE. Following the fall of Babylon to the Achaemenid Empire under Cyrus the Great in 539 BCE, some Judean exiles returned to Jerusalem, inaugurating the formative period in the development of a distinctive Judahite identity in the province of Yehud Medinata.